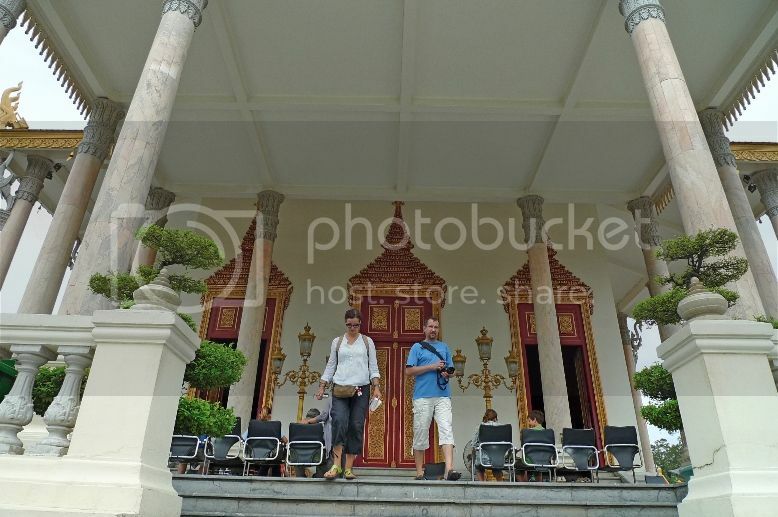 After visiting the Throne Hall, Jam, his friend and I proceeded to visit the Silver Pagoda. 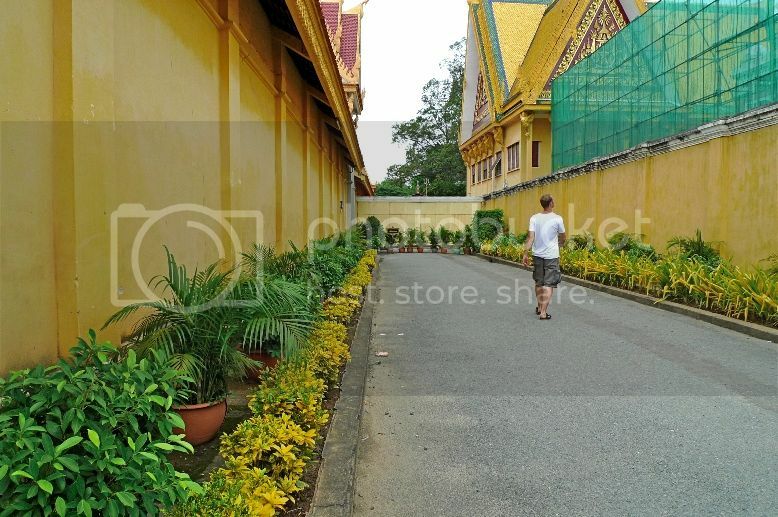 We had to walk through a walled walkway to get there. It was at this walkway that we came across some naughty monkeys. Luckily these aggressive monkeys did not trouble us. 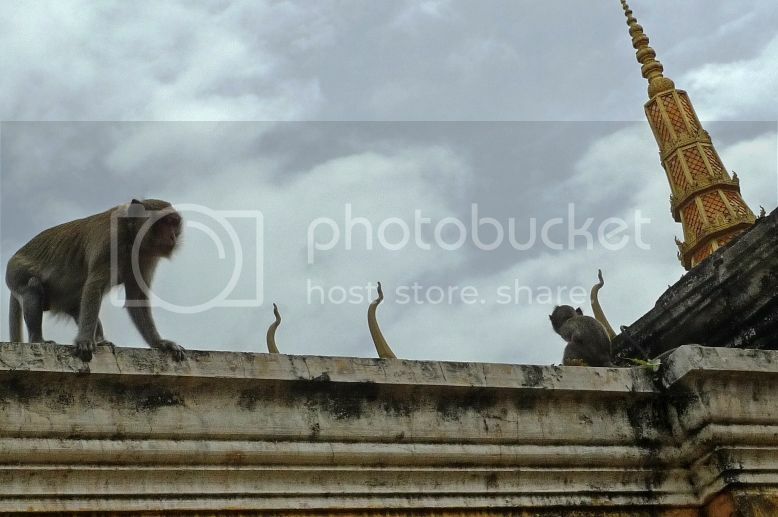 I quickly snapped a photo of two monkeys on top of the wall and walked away. 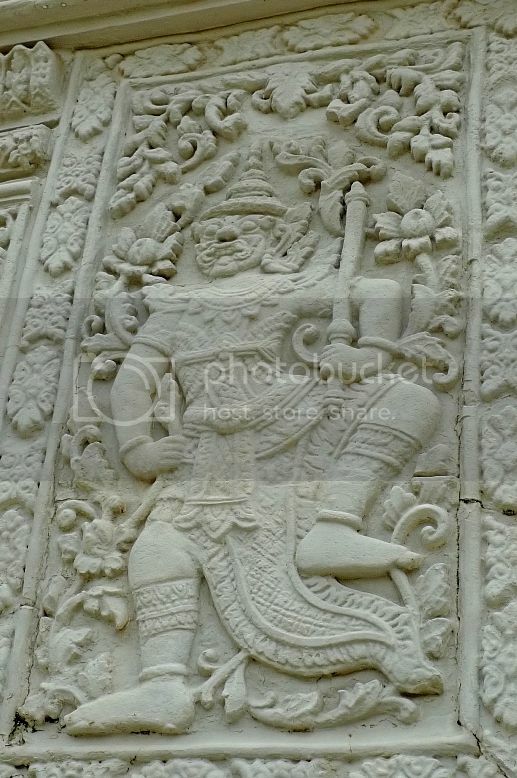 As we entered the Silver Pagoda compound, we could see the compound walls covered with murals depicting stories from the Reamker, which is the Khmer version of the classic Indian epic, the Ramayana. However, we could see that certain parts of the murals were ravaged by time. 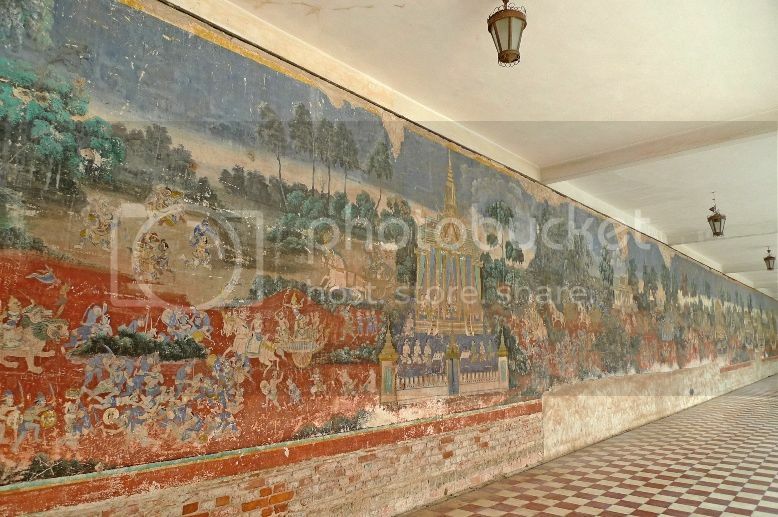 This is not surprising since the murals were first painted more than a century ago, although renovations were carried out between the year 1985 and 1987. 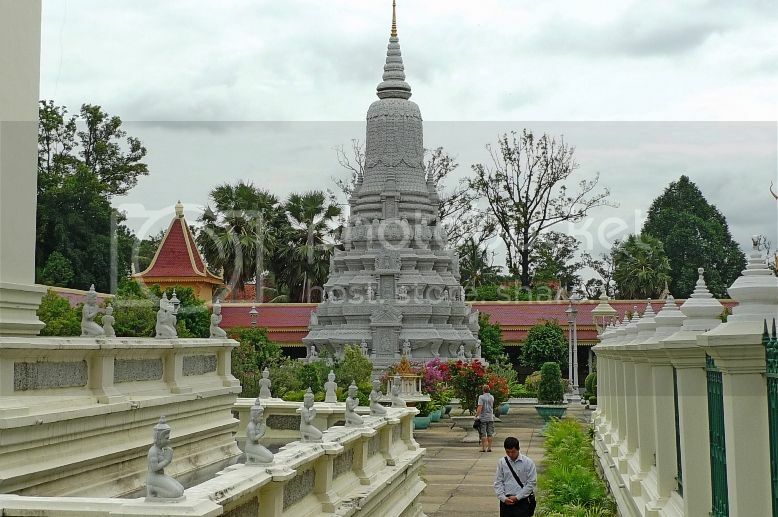 The Silver Pagoda compound contains several structures and gardens, but the main building is Wat Preah Keo Morokat which means 'Temple Of The Emerald Buddha'. 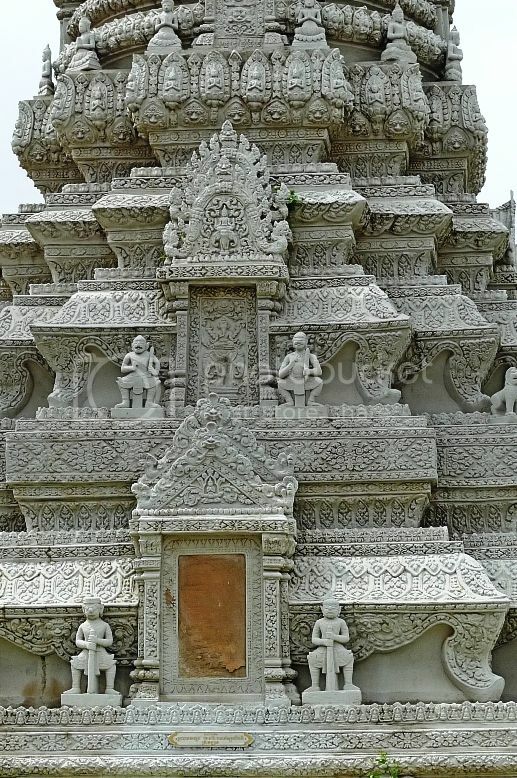 It is also known as Silver Pagoda, so-called because the floor of the temple is covered with 5,329 silver tiles! 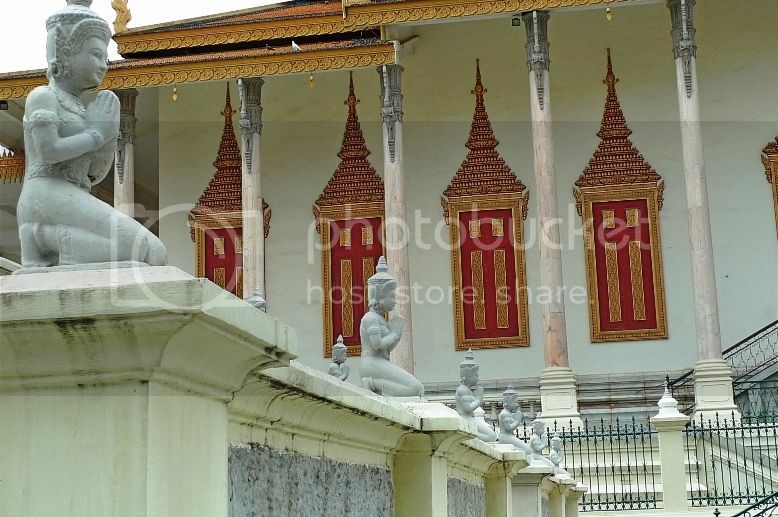 I was attracted to the rows of kneeling Buddha statues adorning the walls of the Library next to the temple. 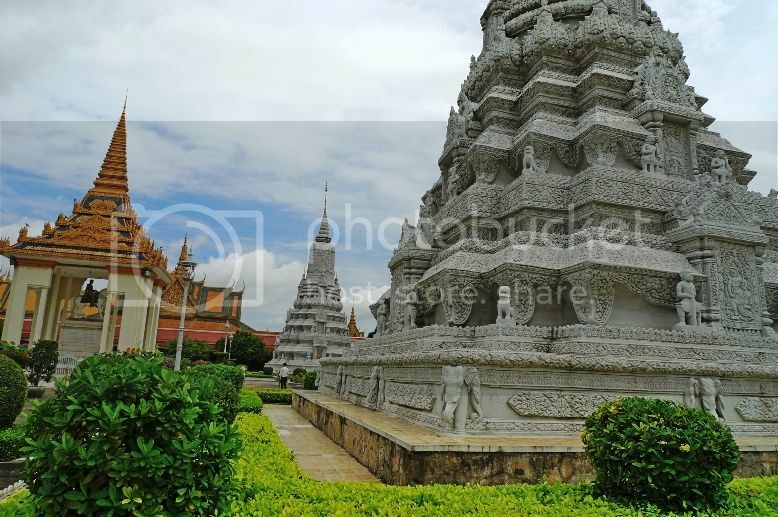 The Silver Pagoda temple looked rather majestic from where I stood. Near the temple were several stupas. I captured one of the stupas from this angle. 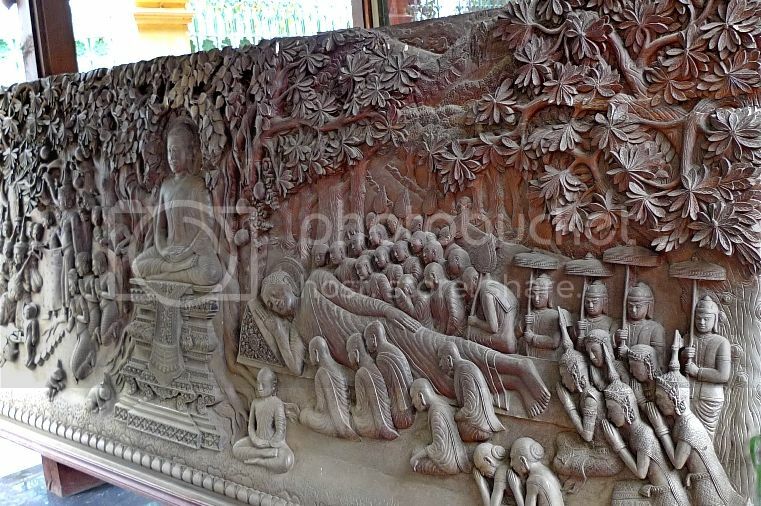 I took another photo of the Buddha statues lining the walls of the library buillding. There must have been at least two dozens of them! 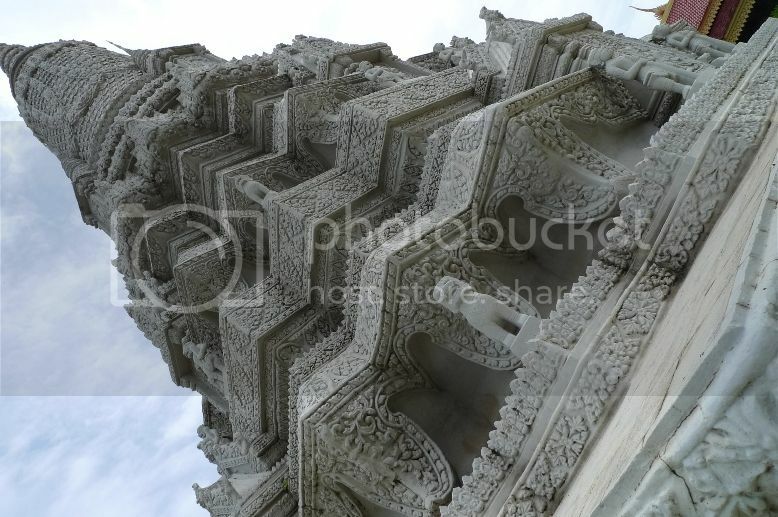 A view of the Silver Pagoda from another angle. 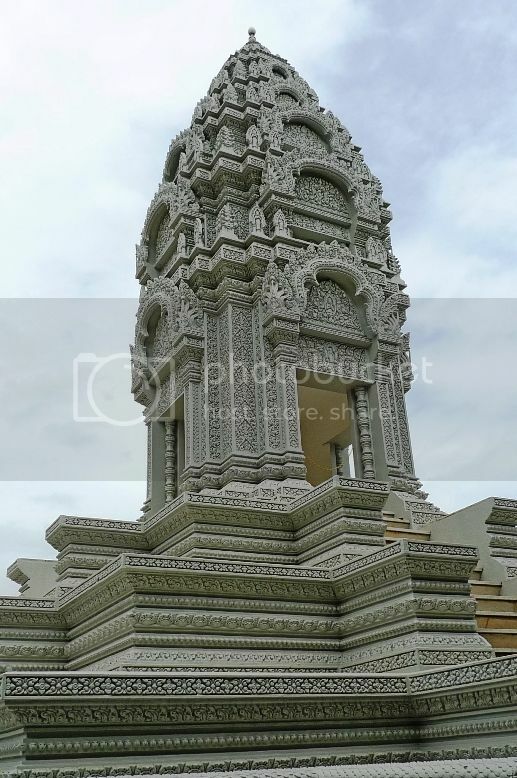 The Silver Pagoda or Wat Preah Keo Morokat is unique in that it is a pagoda where the King meets with the monks to listen to their sermons and where some Royal ceremonies are performed. But unlike most pagodas, no monks live here. 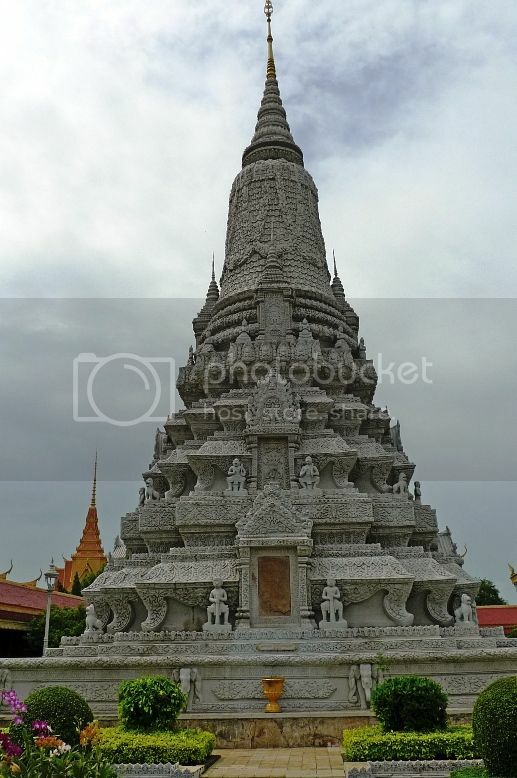 The Silver Pagoda also houses a small 17th century Emerald Buddha (thus the name 'Temple Of The Emerald Buddha') and a life sized gold Maitreya Buddha decorated with 9,584 diamonds dressed in royal regalia commissioned by King Sisowath. Unfortunately, I could not show you the photos of these two priceless treasures as photography was not allowed inside the temple. 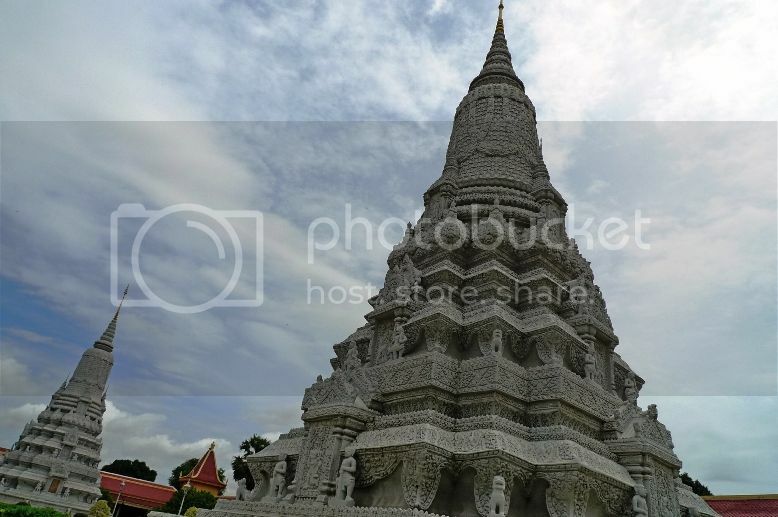 Beautiful view of the Silver Pagoda from another side. 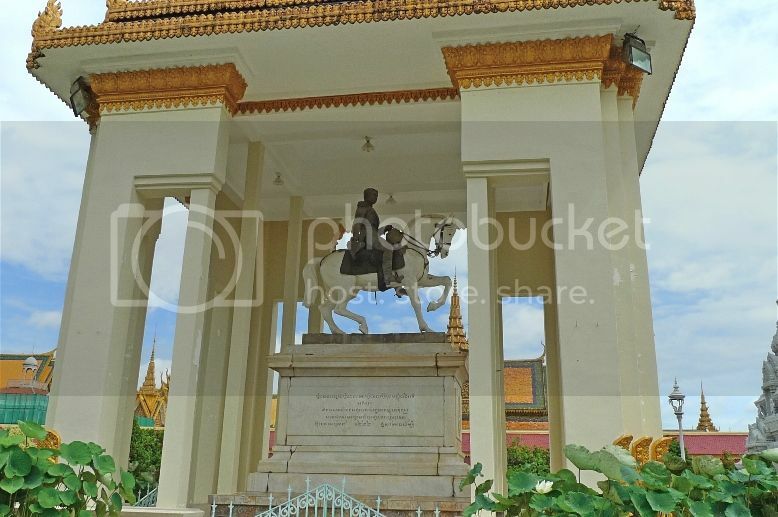 Not far away from the temple building is the Equestrian statue of King Norodom (1834 -1904). Completed by French artist Eude in Paris in 1875, the statue was placed on the pagoda grounds in 1892. 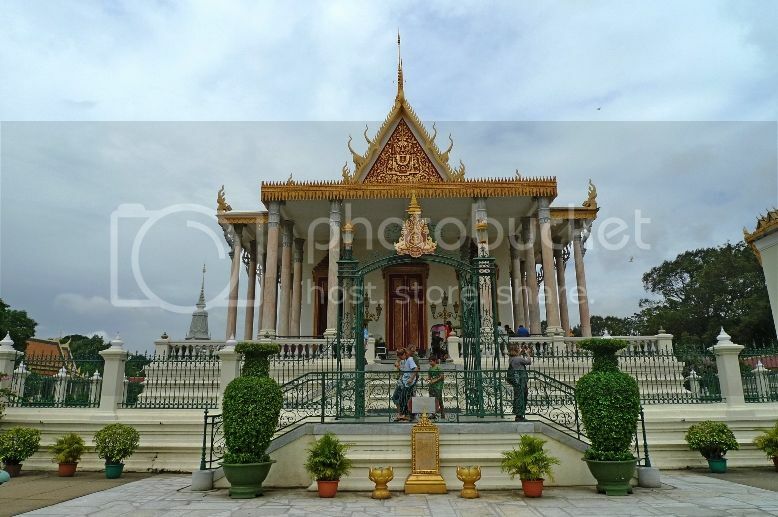 The canopy was added by King Sihanouk in 1953 to honour King Norodom in light of Cambodia's new independence. 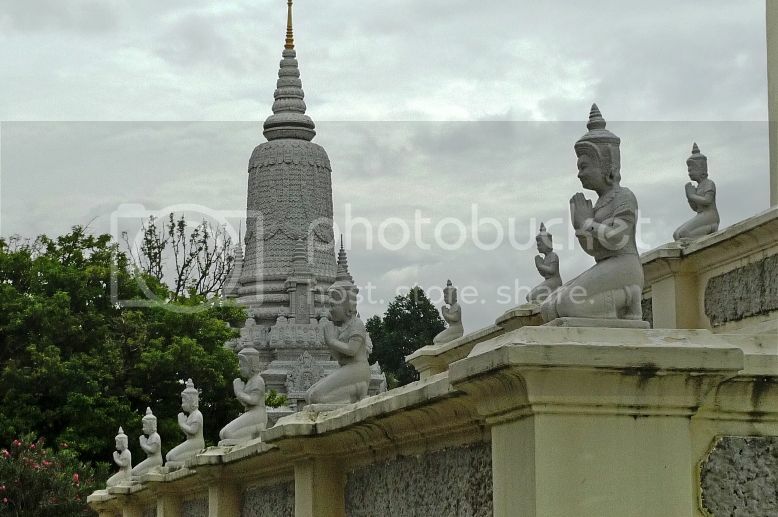 There were several stupas of different Kings, but I am afraid I did not note down which stupa belongs to which King! 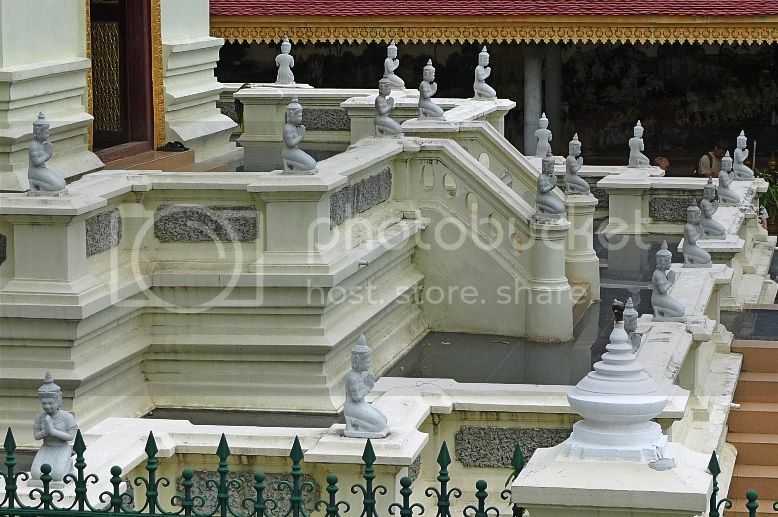 Some of these stupas contain ashes of the Kings. 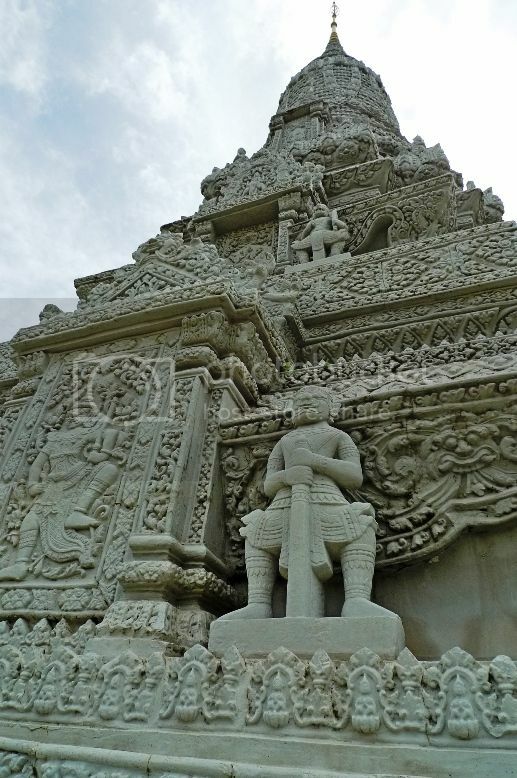 Close shot of one of the stupas. 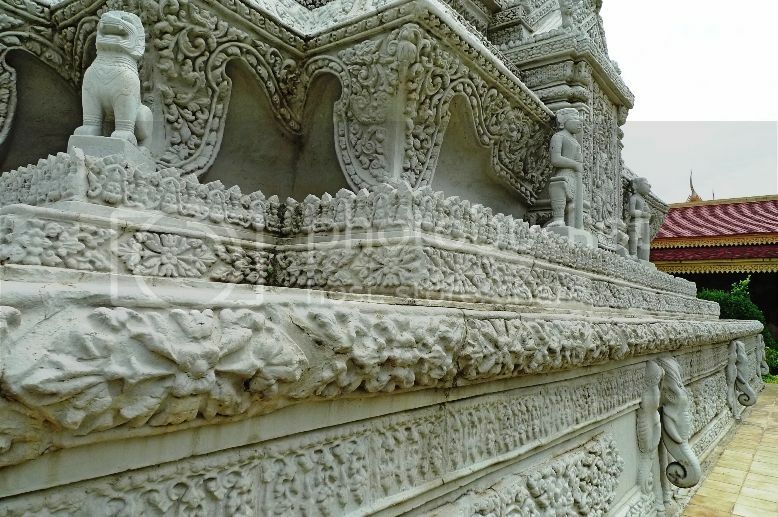 Amazing carvings on the stupa. 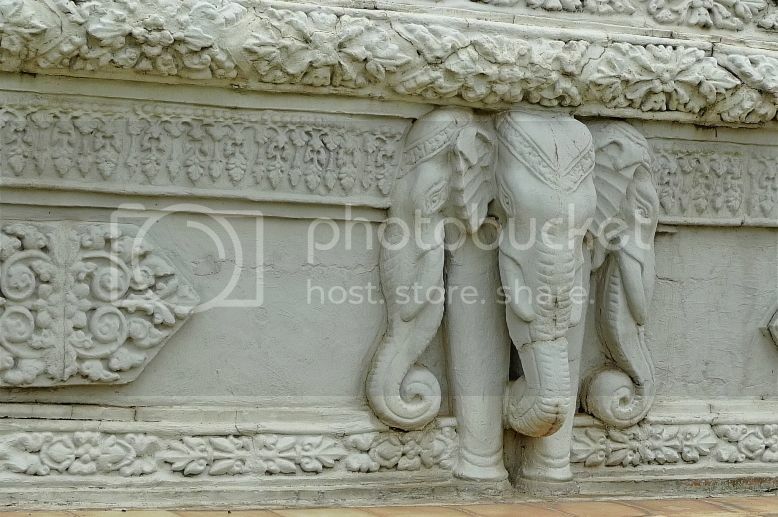 An elephant carving on the stupa. 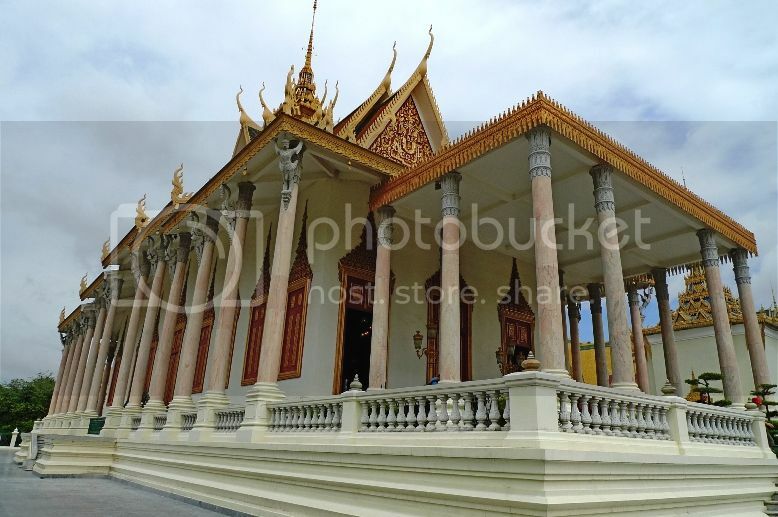 I took several more pictures of the beautiful stupas. Can you see the Equestrian statue of King Norodom below? 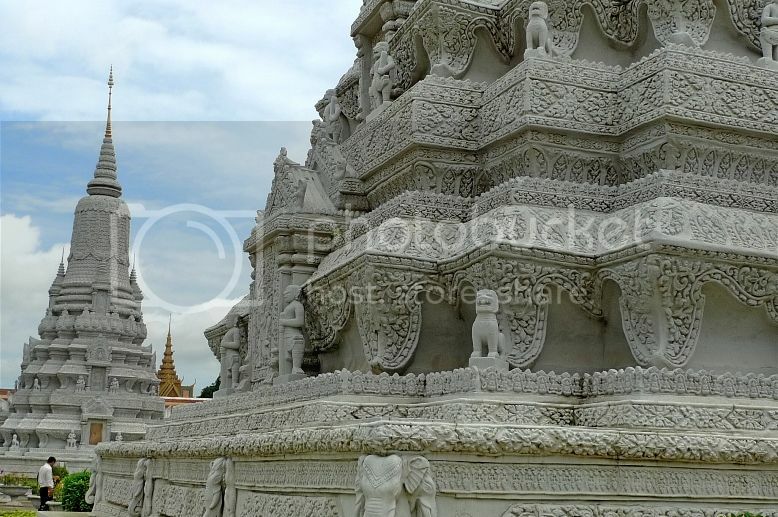 I like this picture of the man who appears so tiny compared with the towering heights of the stupas. 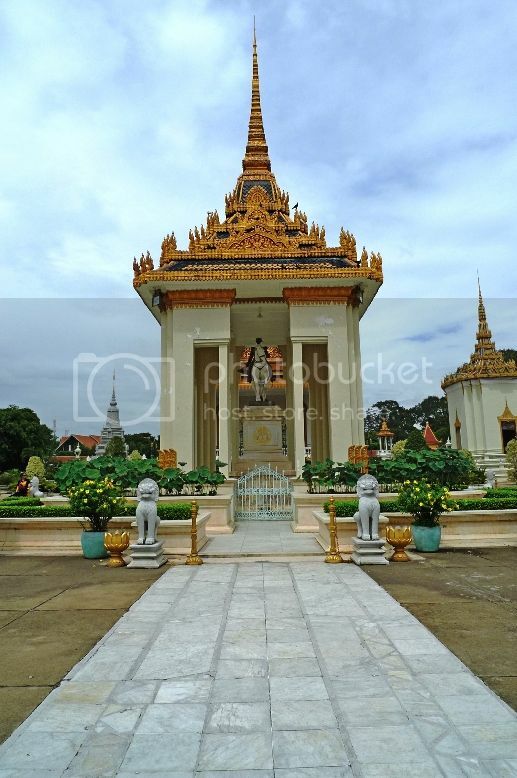 Below is the Stupa of Princess Kantha Bopha, the daughter of former King Sihanouk. I remember this well as it looks different from all the other stupas. 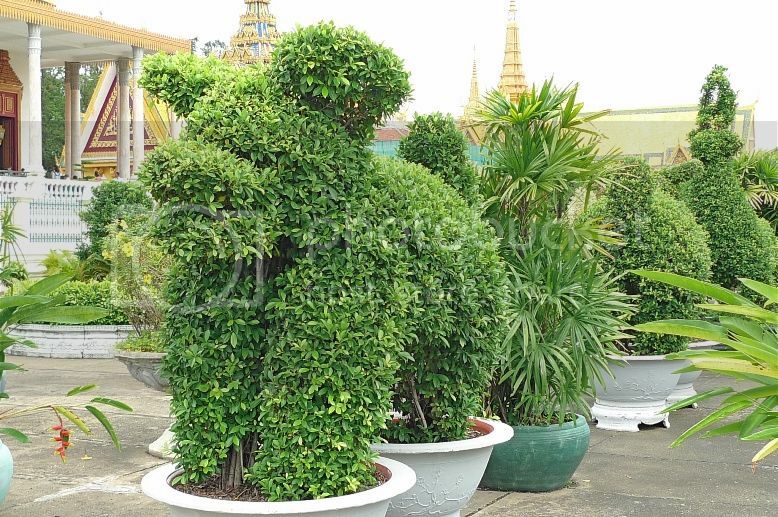 Surrounding the Silver Pagoda temple and all the stupas and monuments is a beautiful garden with plants that were cleverly cut into various animals shapes. Not sure what animal this is though. What do you think it is? But this one is definitely an elephant! 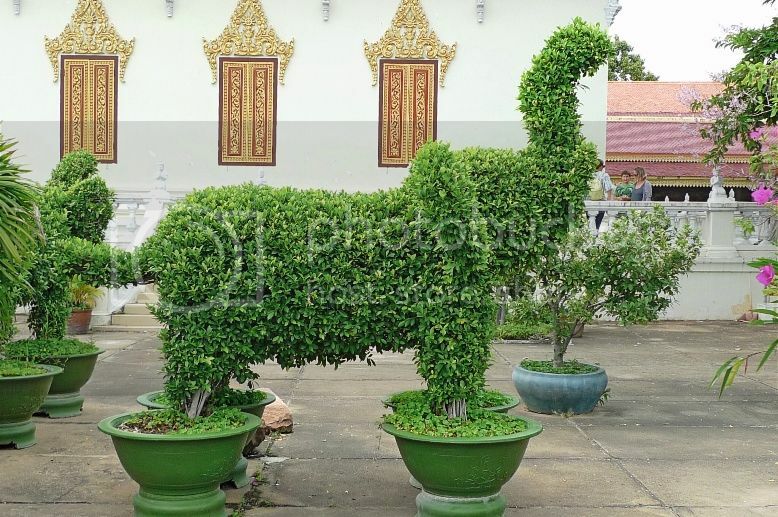 I remember there was a plant that shaped like a deer but could not find the photo! Oh well, maybe I accidentally deleted it. 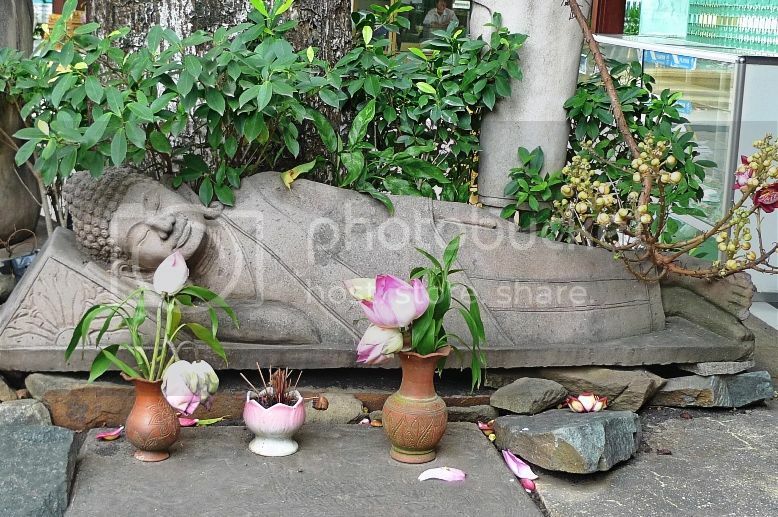 On our way out of the Royal Palace, we came across the Sleeping Buddha. There was an amazing carving near it. 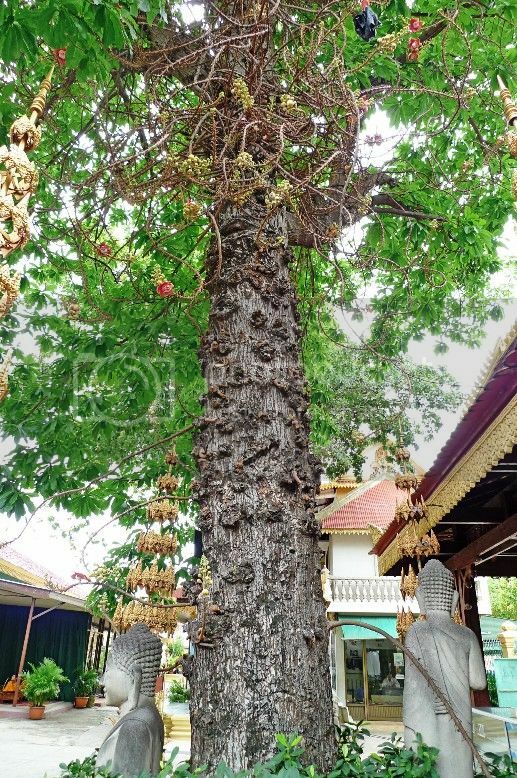 The tree which the Sleeping Buddha slept under was rather strange looking. Have you seen such a tree before? OK, I really did not know what this was but I took a photo of it anyway. 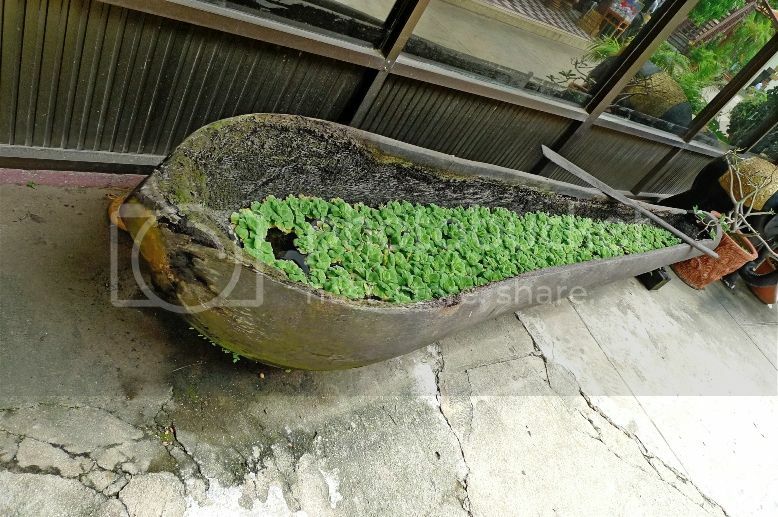 Some kind of plants grown in a boat-like structure. 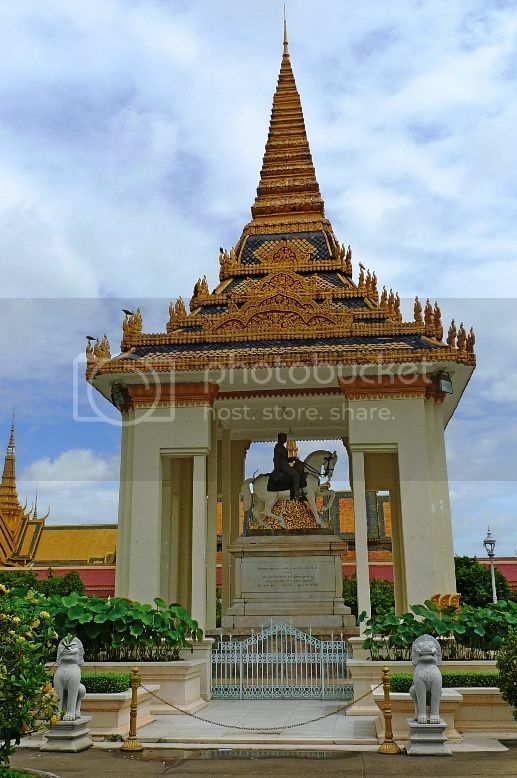 A nice carriage-like structure at the exit of the Royal Palace. 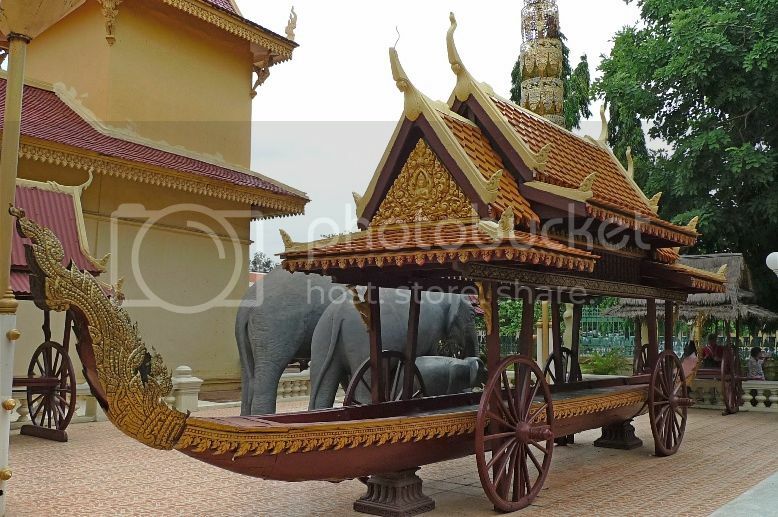 By the way, do you think those elephants next to the carriage are real? 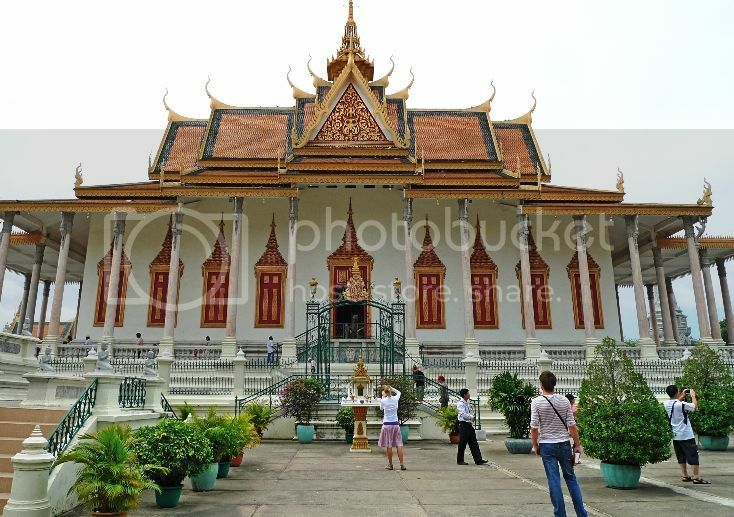 If you ever go to Phnom Penh, do drop by the Royal Palace. It is opened to public 7 days a week from 8am - 11am and 2pm - 5pm. Admission fee is only USD 3 per person which is pretty reasonable to me!